Most facade and waterproofing problems stem from poor and inadequate design and at times inappropriate systems being used for particular situation. Bells specialises in the rectification of water ingress and concrete spalling problems to many areas including: facades, roof tops, podium decks,and balconies. Bells specialises in window cleaning and general building cleaning solutions using industrial rope access (known to many as abseil cleaning), elevating work platforms and reach and wash techniques. Our window cleaning contracts range from some of the highest office blocks in the country through to residential towers, penthouses and atriums for some of the biggest landlords in the Queensland. Bells has extensive experience in painting of high rise buildings and difficult access areas. High rise painting can be performed using abseiling (rope access) techniques and provides an extremely cost effective solution reducing the need for scaffolding or swinging stages. High rise painting can be performed on any type of building or structure. 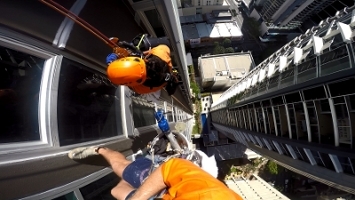 Queensland’s high-rise building owners and managers have been using Bells rope access pressure washing to help maintain their building’s exterior for over ten years. Bells can keep a building free of dirt and grime, calcium build up, water staining, spider webs, mould, mildew, and other debris. This action is critical in maintaining a professional look as well as extending the building’s painting and waterproofing lifecycle. We have pressure washing capabilities for buildings up to 70+ stories and also offer pavement , roadway and car park cleaning. Send us a message and we’ll contact you ASAP.